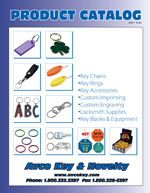 Avco Key and Novelty is a wholesale distributor, manufacturer and importer of key chains, key accessories and key blanks. We supply retail hardware stores, locksmith shops and other key-making establishments with the best selling and most profitable selection of items available. We have searched the globe to bring you the best of the best. Join hundreds of retailers from across the country who rely on us for the largest selection and the most competitive prices in the industry. Over 1400 Key Chains and 800 Key Blanks available. Serving the industry since 1957. Fast Shipping - Most orders ship the same day. Wholesale Pricing is available to qualified retailers and large volume users. Our site is divided into categories based on the type of key chains you are looking for. Click on the image of any category below to begin browsing, or use the category menu on the left. Key tags and identifiers to sort and organize your keys. There are tags in brass, aluminum, stainless steel, paper and plastic. Key ID caps and collars that slip on the head of keys. Also a selection of restroom key tags. Key ID Caps and Rings Vinyl rings and caps that slip over or around the key head to make identifcation easier. Plastic Key Tags Plastic key tags in a variety of styles including Click-it tags, Tags with beaded chains and tags that you can use with a paper insert. Paper Key Tags Key tags made of paper with a metal rim and plain paper tags. Key Cabinet Tags Tags to fit many types and brands of key cabinets. Blank and numbered tags available. Restroom Key Tags Key tags for the bathroom or restroom keys. Aluminum Key Tags Key Tags in Anodized Aluminum and Raw Aluminum. Available blank or custom engraved. Stainless Steel Tags Stainless Steel tags for keys, valves and checks. Available blank or custom engraved. Auto Dealer and Repair Key Tags Key tags used by auto repair shops and dealers. File A Key System A system for storing keys in a book or file cabinet. Practical, versatile and simple. Our basic key chains provide a function and accommodate a need. Wrist Key Holders Plastic coil and elastic band key holders you wear on your wrist. Key Hiders, Rocks, Magnetic Key Cases Ways to hide a spare key. In a magnetic box, velcro pouch, wallet card a rock or a sprinkler head. Bottle Opener Key Rings Carry a handy bottle opener on you keychain. Floating Key Holders A variety of keychains and Key Holders that will float if accidentally dropped overboard. Key Separators, Pull Aparts Key holders that can come apart in multiple sections to separate sets of keys. Nail Clippers Nail clippers and personal items. Plain Lanyards and Neckstrings Carry keys around your neck. Basic plain styles. MLB Team Logo Lanyards Lanyards with the logo of your favorite baseball team. NFL Team Logo Lanyards Lanyards with the logo of your favorite football team. Beaded Neck Chains Beaded Neck Chains in various sizes. Also know as ball chain. Everyday Carry & Tool Key Chains Key chains with a tool attached or a pill holder. Key Cases Leather and vinyl cases to carry keys. Belt key rings are used by policeman, janitors, building managers, drivers and anyone else who needs to carry their keys while keeping them readily accessible. In this section you will find a large selection of key holders for carrying keys upon your pants, belt or belt loop. Carabiner Key Chains Carabiners, also known as climbers clips in different shapes and sizes. Belt Key Holders-Metal There are many ways to carry your keys, in this category we present metal key holders for carrying your keys on your belt. Other Snap Clips Metal Metal snap clips in colors and stainless steel. Coils with Clips Coils with clips for carrying keys or gear. Belt Chain Key Holders Chains to carry keys. Key Bak Brand Retractors Key Retractors and pull key reels by Key Bak. Leather Belt Strap Key Holders Key strap holders for your belt in leather. Nylon Belt Strap Key Holders Key strap holders for your belt in nylon. Fun and Cool Key Chains With a large selection of Cool and Fun Key Chains, we have something to suit everyone. Initials Birthstones Zodiacs Key chains with letters of the alphabet, zodiac signs and birthstones. Patriotic Key Chains God Bless America. Show your patriotic spirit on your keychain. Photo Holder Key Chains Key Chains and Key Tags for carrying a picture or photograph. Sports Key Key Chains Key chains with a sports theme. Stained Glass Key Chains Deluxe key chains that look like stained glass. Deluxe Key Chains Premium keychains suitable for gift giving. Many are engravable. Pewter Key Chains Premium Quality sculpted pewter key rings. Just the ring, or parts to make a key ring. USA Made Split Key Rings Best quality split key rings- made in the USA. Sizes from 15/64 inch up to 2 inch diameter. Brass Split Key Rings Solid Brass Split Key Rings (US Made) and Brass Plated Split Key Rings (imported). Binder Rings Binder Rings open just like a loose leaf notebook ring. Flexible Key Rings Cables A variety of key rings that flex, like thin cables wire or chain or cable. Give Away Rings Thin Wire Give away rings are perfect when cutting new keys to keep them sorted. Also used when you need to save some money as these key rings are very inexpensive. Tamper Proof Key Rings Patented Tamper-Proof Key Ring technology provides you with the ultimate in strength and durability. Key Chain Parts for Assembly Making your own keychains ? We have a selection of the parts you need to make your own keychains. We offer the chain assemblies, jump rings and connectors to make your project work. Promote your business. Custom tags to sort keys. Custom made signs, labels and magnets. 1/16 Inch Thick Custom Key Tags Custom engraved 1/16 inch thick key tags. Engraved one side only. 1/8 Inch Thick Custom Key Tags Custom engraved 1/16 inch thick key tags. Can be engraved on BOTH sides. 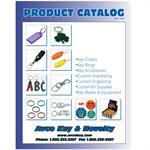 Promotional Items Key chains and other items printed with your logo. Soft Touch Vinyl Key Tags Screen printed and Durable Key Tags printed with your company info. Custom Printed Magnets Full color digital printed magnets to promote your business. Custom Made Engraved Signs Signs available in any shape and Size - Custom made to your specifications. Custom Restroom Key Tags Bathroom and Restroom Key Tags with your personalized text on the back side. Empty Jars and Jugs Clear plastic display jars and jugs. Sold empty. Key Making Machines Machines for cutting and duplicating keys. Key Blank Displays Display racks for keyblanks. Sales Tools for Key Makers Reference books and signs for key making and duplication. Locksmith Tools and Supplies Tool and supplies used in key making. Number and Letter Stamp Sets Hand stamps for stamping letters and/or numbers on keys and tags. We sell only 'JET' brand key blanks. Made in the USA blank keys for duplication. Hotel and Motel Key Blanks key blanks with a large head typically used for hotels, motels and inns. Flat Steel Key Blanks Flat steel key blanks to fit mailbox and old lever type locks. Safe Deposit Key Blanks Nickel silver key blanks to fit safe deposit box locks. Unibow Key Blanks Key blanks with a common head shape. We are your one stop shop for wholesale key blanks, key rings, keychains, key accessories and custom key tags. Individuals may also order directly from our site. Catalog is free, but you must complete checkout to receive it. Item #: AS-10-9017. 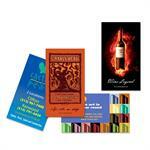 Includes Full color Digital Printing. No Set-up Fee. Made In USA. Minimum 500 Pcs.